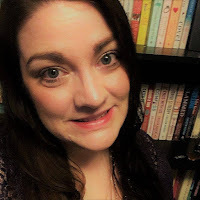 Blogger's Note: Friend and fellow writer Mike Johnson kicks off a series of guests posts, which will appear throughout November while I slip into the insanity that is National Novel Writing Month. Mike shares his unique perspective as a film-maker for his soon-to-be released film, "The Legend of Israel Grimm." My name is Mike Johnson and I am a writer. I have never been published nor particularly recognized for my writing efforts, I only use that title because I have written for as long as I can remember; so it fits. It was always an artistic endeavor that I admired and I felt comfortable doing it. I have gone through many mediums; prose novels, poetry, online message board Role Playing Games. I have always found a way to exercise my literary muse. In recent years, screenwriting has been my main creative outlet. I have written a good dozen short scripts and I finished my first feature length this past year. 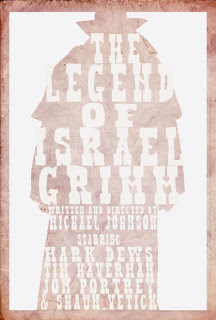 I produced one of my short scripts, "The Legend of Israel Grimm," a supernatural western, this past February and it is very nearly finished. 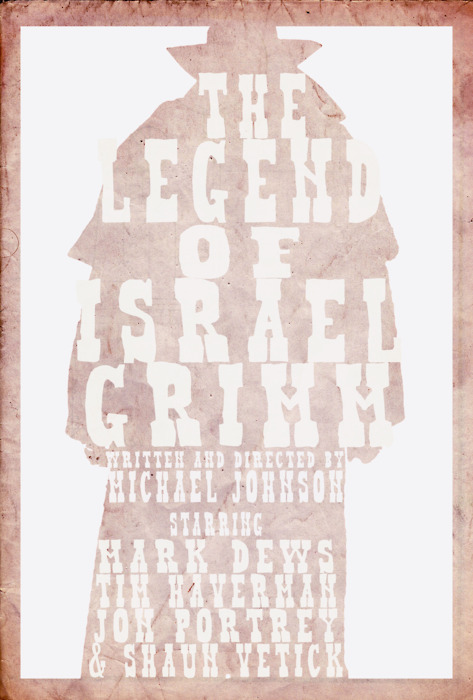 "The Legend of Israel Grimm" started out as a Zombie movie. Sort of. I got an idea for a survival horror concept, in which three convicts were left out in the wilderness by a corrupt Sheriff to fend for themselves. It was meant to be a character drama that was as much about the men surviving each other as it was surviving Mother Nature. My brother, Donnie, and I began brainstorming with that basic concept. Not wanting the script to come off like "Cliffhanger" or "The Edge" or the myriad of other Man vs. Nature projects out there, I thought, "Hey, wouldn't it be cool if it was a Western?" I love Westerns. I grew up in a small ranch town. My mother grew up on a ranch. The cowboy culture and lifestyle was ingrained into me from a very young age. John Wayne and Clint Eastwood were very much a part of my upbringing. And I had only come to love them more as I grew older. But that wasn't enough for me. "What if there was a supernatural element to it?" An interesting idea, one that certainly appealed to me. In addition to Westerns (and, let's face it, most cinema), I have a love of the weird and wonderful. In my writing, I tend to follow a particular maxim: WWGDTD? What would Guillermo Del Toro do? It only took me a moment to realize I had my answer. Guillermo Del Toro would put a supernatural element into it. Zombies were the first idea. Cowboys vs. Zombies. I'd seen it done, but not particularly well. And not with the tone I was shooting for. I wanted something serious, with the cheek being firmly without tongue. But yet, there was something decidedly un-mysterious about Zombies. You knew what to expect from them and they were decidedly, still, a fairly silly concept. Besides, who wants to make ANOTHER Zombie movie these days? I feel that I should mention here that I tend to write with my budget in mind. As an independent film maker, I find it is best to know your limitations and embrace them, when possible. A Western was already pushing my shoe-string budget, with costumes and locations and horses and… it boggled the mind and it wasn't until much later that I figured out exactly how crazy I was to try it. So, with the expenses of a Western looming on the horizon, adding a hoard of Zombies to the picture seemed like an even more foolhardy undertaking. Add to that the aforementioned Zombie fatigue and we were looking at a different project. Some sort of monster or beast? Nah. Ghost? Ghost I could get behind. And it would fit in nicely with my tale of survival. A wandering ghost out on the prairie who just so happens to come across these men left to fend for themselves? Perfect. And a ghostly presence wouldn't be overpowering to the true story I wanted to tell. It would only enhance the feeling of dread that one would get from being left in the middle of nowhere with people you would just as soon kill you and look at you. So I got to work writing it and finished the script in record time. And I loved it. It was scary in the right places and ended in a badass gunfight that any Western aficionado would love. But what was I going to do with it? I didn't have the money to make a Western? What was I thinking? Cost of the costumes alone, if they were going to be truly appropriate, sent my heart plummeting to my gut. Impossible. But, like a good writer craving positive reinforcement, I sent it out to friends anyhow, just to see what they thought. The response was overwhelmingly good. Everyone was so positive and excited about the idea that I became infected with, "What if I could pull it off?" fever. This would be my second solo production. I had worked on a few feature films as miscellaneous crew the summer before, and had learned enough and met enough people who knew much more than I that I was able to produce another script that past August. But it's scope was nothing like "Israel Grimm's." The more I sent it around, the more people kept asking me, "When are you going to do it?" I ran out of excuses not to and I suddenly became that kid who was making a Western. I received notes on my script. My badass gunfight at the end didn't work for other people as well as it did me and, they were right. So I rewrote it and liked the new version better. And I did more rewrites and more reworkings. And then it was time to cast the thing. And once I got my actors, more changed needed to happen, because they gave new meaning and interpretations to the words I had written. More changed during filming itself. Scenes that worked well on the page fell apart in actuality. Logistics and time constraints caused us to cut whole sections. 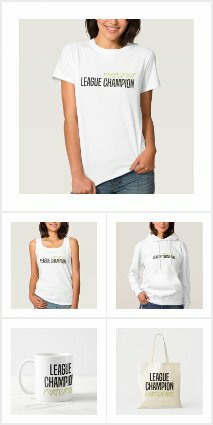 As a writer, my heart was breaking with each change. I had put my whole self into this script, how could I change anything? But my role as a writer was over. I was now mostly a producer*, making sure that everything got done as best as we could and if that meant ripping the script apart, then so be it. My scope had to extend beyond the page. And this only increased when we wrapped filming and began post-production. If I thought that filming was a catalyst for change, editing brought about ten times the amount of change. We were able to look back at what we had filmed and realized what really didn't work when we weren't numbed by cold and fatigue and frustration. Again, whole scenes that I had once loved suddenly became extraneous and unnecessary. But the greater good has prevailed and, on the verge of having a completed film I look back on the early days with wistful sentimentality. I realize I was naive to think that I could pull off everything I had in my head. But that doesn't mean it didn't become something greater than what I had imagined. It may not be what I had originally written, but it is a real, tangible thing. And that means everything. Mike Johnson is an independent writer and film maker, look for his production company, Noseatbelts Productions, on Facebook and check out "The Legend of Israel Grimm" on tumblr at israelgrimm.tumblr.com.